Saint Paul et Les Martyrs d'Haiti Episcopal Church, Miami FL, in the Diocese of Southeast Florida celebrated the birth of their verger's ministry on October 24, 2010, with the installation of three vergers. The new vergers are Oslyne Gaston,Gregory Seme, and Armide Bastien. C. W. "Bill" Swinford, retired from his ministry as a Verger on Sunday, July 4, 2010. Bill had served Christ Church Cathedral in Lexington, Kentucky for ten years. For the past six years, he has been responsible for recruiting, training, and scheduling lectors and intercessors. Bill and his wife Anne plan to do some extra traveling now that they have an "empty nest." Bill received a clock as a remembrance of his time served and also as a reminder of the time he now has to pursue other interests! The Vergers' Guild of the Episcopal Church will gather for the 2010 annual conference and Eucharist on Thursday October 7th through Sunday October 10th at National Cathedral in Washington, DC. This will be the 22nd year that the Guild will come together for fellowship, training, business, and worship and we will be hosted and coordinated this year by Cathedral Head Verger Duke DuTeil and his wonderful staff and volunteers. This year's event will coincide with the National Acolyte Festival held annually at the Cathedral. This is a wonderful and festive celebration and re-dedication of Acolytes from around the country. This certainly will be a Vergers' Guild weekend not to be missed!. 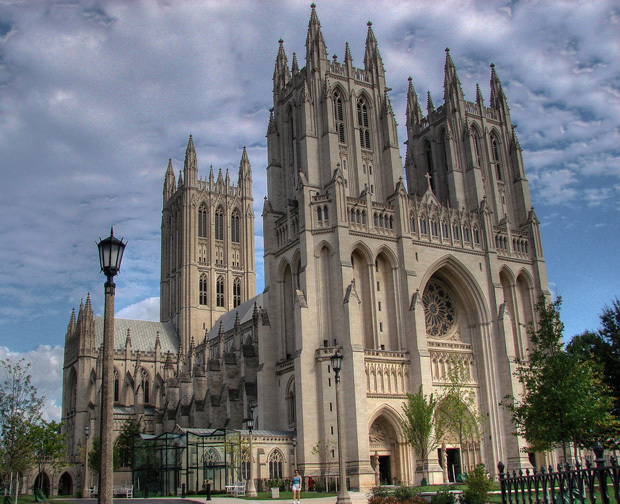 Online registration is available at the Washington National Cathedral ticket office using Visa or MasterCard. Complete information is available at www.vergers.org/conference/2010. The Vergers' Guild of the Episcopal Church celebrated the start of the second decade of the twenty-first century with the launch of their brand new web site at www.vergers.org. According to Scott Smith, Guild Web Master, "This is a significant step forward for the Guild's communication abilities from where we have been in the past. Along with our new V-Happenings e-mail news distribution service, the new site will keep our membership and interested parties up to date about Guild activities in a timely, informative, and fun way." The new site has a new "Guild Shoppe Online Store" that features many products and services from the Guild that were previously unavailable for purchase online. Guild President Margaret McLarty added, "The new web site brings a fresh face to the Vergers' Guild as we enter the new year. We have added some pretty innovative features to the site like V-Happenings and our new VergerTV video service on YouTube. Also, we have added a 2010 online membership map that shows our growing numbers as our total membership approaches 1,000 members." In addition, all site content has been updated and re-edited for accuracy to be aligned with the current nature of the Vergers' Guild. The Guild joins their sister organization The Church of England Guild of Vergers who last fall launched their new site as well at www.cofegv.org.uk.